^ a b Iyengar, P. T. Srinivasa (1929-01-01). 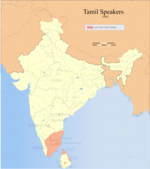 History of the Tamils from the Earliest Times to 600 A.D. Asian Educational Services. ISBN 9788120601451. ^ a b c d e f g h i j k l m n o p q r International Journal of Dravidian Linguistics: IJDL. Department of Linguistics, University of Kerala. 2001-01-01. This page was last edited on 10 March 2019, at 09:39 (UTC).